Quadstar II BUY Biomedical Life Systems, Electrotherapy, INF Therapy, NMS, TENS SALE Interferential Stimulator, KQST, Neuromuscular Stimulator. Quadstar II by Biomedical Life Systems is a Multi Modality Sequential Stimulator for Electrotherapy. 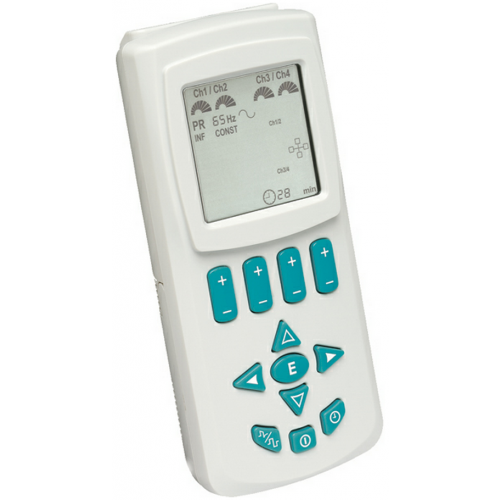 This digital Electrotherapy Medical Device is a portable Sequential Muscle Stimulator with 4 channels, delivering NMS, INF and TENS sequential stimulation. A graphic representation of the timing parameters is shown on the Quadstar II screen to assist the user to program the on/off ramps and on/off times. The Biomedical Life Systems Quadstar II treats pain, muscle issues and edema that are often associated with injuries. Quadstar II Electrotherapy Device has 9 preprogrammed fixed sequences which enable the user to program 20 minutes of INF to loosen muscles, followed by 20 minutes of NMS therapy and then 20 minutes of TENS therapy for pain relief. The TENS has 3 modes of operation; constant, burst, and modulation. 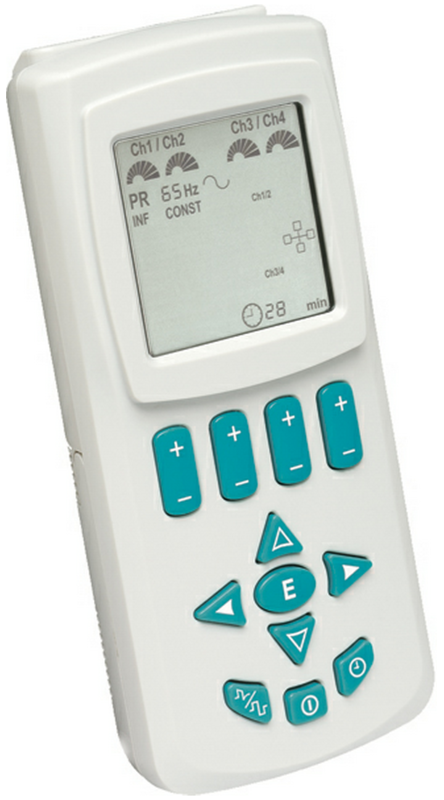 The INF has adjustable frequency and 4 stimulation modes. The NMS has 3 adjustable modes. In addition, the Biomedical Life Systems Quadstar II has a patient lock system that holds the prescription settings for ease of use and records the number of hours used to ensure compliance. By using 4 AA batteries that are not included, the Quadstar II Multi Modality Sequential Electrotherapy Stimulator has portability and mobility to use almost anywhere. A power cord is included that provides in-office or home therapy use. Biomedical Life Systems provides a 5 year warranty for the Quadstar II. Provides Multi Modality for NMS Therapy, INF Therapy and TENS Therapy. INF has adjustable frequency and 4 stimulation modes. TENS has 3 modes of operation; constant, burst, and modulation. Quadstar II Sequential Electrotherapy Stimulator Product Number: KQST. Power Source: AC or 4 AA batteries. Beat Frequency: 1 – 150 Hz. Intensity: 0 – 98 nA peak to peak. Output Voltage: 0-33 V peak to peak adjustable. Waveform: Symmetrical, biphasic, square Asymmetrical, biphasic, square. Pulse Rate: Adjustable 1 – 120 Hz peak to peak. Pulse Width: Adjustable 50 – 400 uS. Intensity: 0 – 120 mA peak to peak adjustable. Output Voltage: 0-60 V peak to peak adjustable. Pulse Rate: Adjustable 1 – 120 Hz. Pulse Width: Adjustable 10 – 250 uS. Intensity: 0 – 100 mA peak to peak. Output Voltage: 0-50 V peak to peak. Manufacturer: Biomedical Life Systems Corp.
Biomedical Life Systems Quadstar II Warranty: 5 Years. The Quadstar II is so good, that when we lost our first on in the garage after our move, we decided to buy a second one; so that our therapy could continue and we weren't unhappy that we would have two once we find our fist one squirreled away in our garage. This is one of the best purchases I have made. I have tried other units and this by far is the best. Shipping was fast and have had no problems with it at all. My PTA program uses these to teach students and they are durable. Strongest portable INF stim I could find. Own an "ancient" INF from the same manufacturer, but was not nearly as strong as this one, plus this one has 4 channels! Great product. Buy it.